One of Central London’s primary bridges, Blackfriars Bridge is both a busy thoroughfare and a historical monument. The landmark dates to the 19th century, was dedicated by Queen Victoria, and is distinctive for its red-and-white paint and pulpit-shaped pillars. You can cross Blackfriars Bridge either as a pedestrian or in a vehicle. Not to be confused with Blackfriars Railway Bridge to the east, Blackfriars Bridge is a major London bridge with history dating back centuries. Named for the Dominican monastery that once stood at its northern end, the bridge links the City of London with the South Bank. The original bridge was constructed in 1769 and demolished in 1860; today's version dates to 1869. Admire the bridge's painted iron arches and its stone sculptures, which include pulpit-shaped pillars and carvings of swans and sea birds, as you walk or drive across, or from a Thames river cruise. The landmark also features on various walking tour itineraries of London, including lively pub crawls. 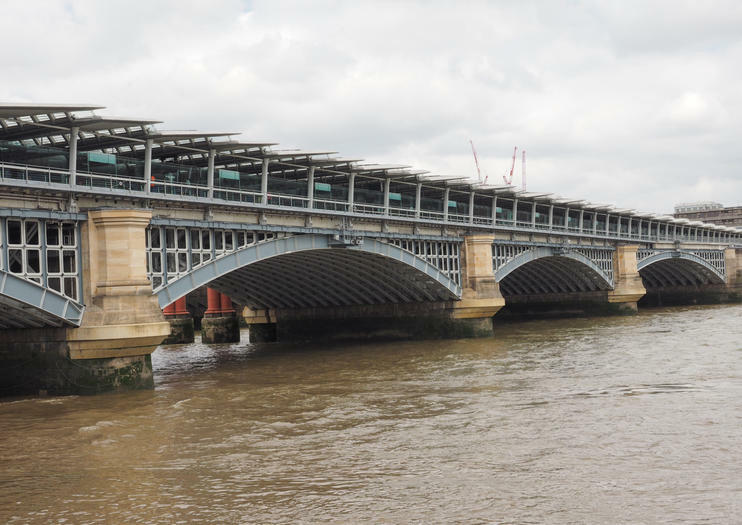 As Blackfriars Bridge is 922 feet (281 meters) across; it takes only a few minutes to walk the landmark. At the northern end of the bridge, look for a memorial statue of Queen Victoria. Blackfriars Bridge is one of the many London bridges that cross the Thames. Blackfriars Station is steps from Blackfriars Bridge and is served by the Central and District Underground lines, as well as Thameslink and Southeastern rail services. Blackfriars Pier is also nearby, for those traveling by boat. The bridge can additionally be reached on foot, by bike, or by car. Blackfriars Bridge is open daily, except during rare special occasions (including New Year’s Eve and the Lord Mayor’s Show). Time your stroll with late afternoon or early evening to admire views of the London skyline lit up during the golden hour. Written about by Harold Pinter and Neil Gaiman and featured in films ranging from Harry Potter and the Order of the Phoenix to The Avengers, Blackfriars Bridge has long held a place in popular culture. The landmark also has certain macabre associations due to the death of Roberto Calvi, an Italian banker who was murdered by the mafia and found hanging from the bridge in 1982. Experience London’s traditional drinking scene on this 3-hour afternoon pub crawl. Accompany your guide on a fun and educational tour in and around the city, where you’ll visit at least four historic pubs and taste different brews (own expense). Pop into centuries-old ale houses, see literary haunts favored by writers like Charles Dickens, and learn about local drinking culture through the ages.